The Kentucky House of Representatives is the lower house of the Kentucky General Assembly. It is composed of 100 Representatives elected from single-member districts throughout the Commonwealth. Not more than two counties can be joined to form a House district, except when necessary to preserve the principle of equal representation. Representatives are elected to two-year terms with no term limits. The Kentucky House of Representatives convenes at the State Capitol in Frankfort. 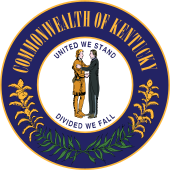 The first meeting of the Kentucky House of Representatives was in Lexington, Kentucky, in 1792, shortly after statehood. During the first legislative session, legislators chose Frankfort, Kentucky to be the permanent state capital. After women gained suffrage in Kentucky, Mary Elliott Flanery was elected as the first female member of the Kentucky House of Representative. She took her seat January 1922 and was the first female legislator elected south of the Mason–Dixon line. Section 47 of the Kentucky Constitution stipulates that all bills for raising revenue must originate in the House of Representatives. According to Section 32 of the Kentucky Constitution, a state representative must: be a citizen of Kentucky, be at least 24 years old at the time of election, have resided in the state at least 2 years and the district at least 1 year prior to election. Per section 30 of the Kentucky Constitution, representatives are elected every two years in the November following a regular session of the General Assembly. The Speaker of the Kentucky House of Representatives is the chief presiding officer of the Kentucky House. The Speaker's official duties include maintaining order in the House, recognizing members during debate, appointing committee chairs and determining the composition of committees, and determining which committee has jurisdiction over which bill. Traditionally, the Speaker has also served as Chair of the Rules Committee and the Committee on Committees. When the Speaker is absent from the floor or otherwise unavailable, the Speaker pro tempore fills in as the chief presiding officer of the House. In addition to the Speaker and Speaker pro tem, each party caucus elects a floor leader, a whip, and caucus chair. ^ Powers, James C. (1992). John E. Kleber (ed.). The Kentucky Encyclopedia. Lexington, Kentucky: The University Press of Kentucky. pp. 323–324. ISBN 0-8131-1772-0. Retrieved March 11, 2010. ^ Gerth, Joseph (November 8, 2015). "Ky. Dems guard against efforts to flip House". Courier-Journal. Retrieved January 6, 2016. ^ Warren, Michael (November 30, 2016). "Democrats Lose a Southern Holdout". The Weekly Standard. Retrieved December 14, 2016. This page was last edited on 18 April 2019, at 22:51 (UTC).